Top Tip: One single-use pack of Sugru is enough to attach two coins or two magnets. 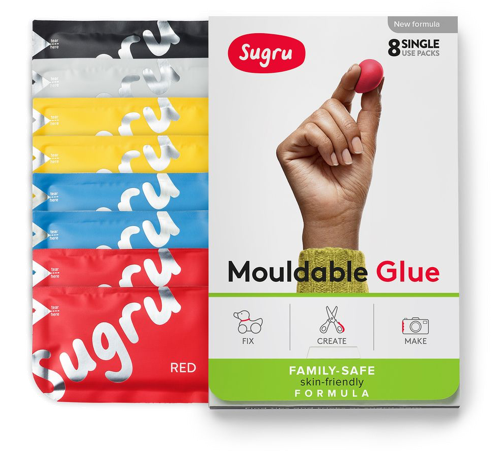 Cut open a mini pack of Sugru and divide it into two equal parts. Squidge one piece onto the back of the coin and press it into a pyramid shape. Top Tip: Make sure the surface you are applying the Sugru to is clean. Using the method from Step 1, build a Sugru pyramid on the back of the magnet, and attach it to your car's dashboard. We also added a little blob of Sugru, to keep the phone stable. Leave the Sugru for 24 hours to fully cure. Then enjoy your new snap-on phone mount! Using the method from Step 1, attach two coins to the bottom of your GPS device. Use the coins to measure and mark out where you want your GPS to sit on your dashboard. Top Tip: make sure the coins on your GPS and the magnets on the dashboard match up to ensure a nice snap! Attach two magnets on your dashboard. Leave the Sugru to fully cure for 24 hours before using. Enjoy your new snap-on GPS mount. We have also attached a coin to our GPS cable, to keep things nice and tidy. If you've found any other clever little uses for Sugru + magnets in the car or anywhere else, we'd love to hear them.